with the plasma body / field- of ancestral memory? The GROUND of Being: A "Fractal Field"
and so called "Objective Knowledge". The AUra-gen (Golden UR) of the word Halloween- is the root "All Hallows Eve". Hallow- has root not only in the word holy - but also whole- and 'hollow'. The reason the test for who is spiritual master- in the Gurdjieff Sufi film 'Meetings with Remarkable Men' is WHO can make the best echo (in the 'hollow') is that the most spiritual ELECTRICAL field - IS the one with the infinite ECHO! Etymolgy of HOLY - from our holy Wiki: "The English word holy dates back to at least the 11th Century with the Old English word hālig, an adjective derived from hāl meaning whole and used to mean 'uninjured, sound, healthy, entire, complete’. The Scottish 'hale' (health, happiness and wholeness.) is the most complete modern form of this Old English root. The modern word 'health' is also derived from the Old English hal. As “wholeness”, holiness may be taken to indicate a state of religious completeness or perfection". We now know in the technique to measure a 'holy space' as field effect (which predicts how well seeds germinate there- and whether phone calls to ancestors happen there)- that the harmonic inclusivness must be WHOLEY present. (The same way medical doctors check your heart- to predict how long your immune system will last). There is a complementary way to examine the root of 'HOLY': Using technique like Fabre D'Olivet (Hebraic Tongue Restored)- and / or John Michell (Euphonics)- to dissect the universal root- we have "He" (Hebrew for 5 ness, space filling, amorphic- literally 'The Breath of Charge') and "the A sound" - meaning Harmonic Inclusiveness- connectivity epitomized (opposite of "the E sound" - which is harmonic Exclusiveness- separateness epitomized). So- the "HA" sound in Hallow or Holy- means- the principle where ('living') plasma or charge can 'breathe' into HARMONIC inclusiveness (fractality - literally- a charged space). The "Eve"( Evening) - second part of the root- All Hallows Eve- when dissected in this way - refers not only to the 'evening' - but more to AVE or Eve. Ave - meaning HOLY- has the root- WHERE THE BREATH OF - either "Aaah" (inclusivity) or"EEEE" (exclusivity) of charge - or living plasma - ENTERS THE V Vortex of FIVENESS ... and TAKES FLIGHT > has the possibility of entering DISTRIBUTION perfected- and THEREFORE Immortality. Compare to the physics root of the Hebrew word for Heaven: "Planes of Sharon" , - literally - the infinite ('di-vine'- perfectly branched)- charge distribution fields of the phase conjugate dielectric- as in Gold Powder (Manna-ORMES-'the spice' see the physics review). Heaven and Holy both refer to the (perfection of) 'the flight of charge or plasma' from the body. So we now know a great deal of the physics of successful death ( goldenmean.info/immortality ) - how the plasma leaves the body - and where it goes. Specifically- as we have often mentioned- the ability of enter DREAMING TRACK- or SONG LINE- requires entering into a measureable magnetic line (which has phase conjugate / fractal - charge distribution INVITED qualities). This was why we URged you to reaarange the MAGnetic map around your bed (& house and garden.. & your town) to look like a rose. Dowse- eliminate metal and electosmog- place BIOLOGIC materials - into fractal array - to create aura vitality- health- bliss - lucid dreaming and successful birth or death. The 'holy' place! We discussed the study ( goldenmean.info/pain ) where the New Jersey Institute of Tech- anaesthesiologist - professor- arranged a ovoid of strong paramagnetic stones ( 'Ka'- BOAT INTO THE UNDERWORLD) around the hospital operating table- and measured a significant average decrease in recovery times from a wide variety of common surgeries. The physics is - that if your plasma (halloween GHOST) - has a fractal place - of leverage- from which to come and go- (birth - death- dream- or induced- anaesthesia- ) THEN your entry and return connection- are improved. We have a new & powerful electrical definition for Pain: the fractal that bleeds (charge or plasma) - versus healing and pain reduction- defined as compression restored. We are currently placing the correct PHASE CONJUGATE MAGNETIC field - into the PYRAPHI / ICOSAPHI - (now that I discovered the correct magnetic harmonics - from my equation for hydrogen - planck length AND time- times golden ratio : goldenmean.info/goldenproof ). ... AND > invite communication with the PLASMA OF ANCESTORS- hence- ALL HALLOWS EVE! (which the Hopi knew well when they demanded the American Government remove the opposite to fractal steel sewage pipes from their ancestors bURial ground). "Patrick Wilcken first interviewed the celebrated French anthropologist Claude Lévi-Strauss in 2005. For Mr. Wilcken an audience with the great man must have been a daunting occasion: Mr. Wilcken had a biography in the works, and his subject was then well into his 90s. (He died in 2009, just short of his 101st birthday.) And even at that late date Mr. Wilcken wanted Lévi-Strauss to address some of the fundamental issues raised by his work. Claude Lévi-Strauss is the subject of a new biography. CLAUDE LÉVI-STRAUSS The Poet in His Laboratory By Patrick Wilcken. But Lévi-Strauss was known to regard the interview as “a detestable genre.” And if Mr. Wilcken expected much cooperation, he was in for a surprise. “Lévi-Strauss appeared not to want to talk about his theories,” Mr. Wilcken writes of this encounter. “When I asked him about the legacy of his work, if there were other people pursuing his ideas, whether he thought his theories would live on, he was disarmingly blunt: ‘I don’t know and I don’t care.’ ” Mr. Wilcken’s own research and observations, however, are enough to make “Claude Lévi-Strauss,” subtitled “The Poet in His Laboratory,” an illuminating study." "Mythologiques," his four-volume work about the structure of native mythology in the Americas, attempts nothing less than an interpretation of the world of culture and custom, shaped by analysis of several hundred myths of little-known tribes and traditions. The volumes - "The Raw and the Cooked," "From Honey to Ashes," "The Origin of Table Manners" and "The Naked Man," published from 1964 to 1971 - challenge the reader with their complex interweaving of theme and detail. His interpretations of North and South American myths were pivotal in changing Western thinking about so-called primitive societies. The accepted view held that primitive societies were intellectually unimaginative and temperamentally irrational, basing their approaches to life and religion on the satisfaction of urgent needs for food, clothing and shelter. Mr. Lévi-Strauss rescued his (raw or savage?) subjects from this limited perspective. Beginning with the Caduveo and Bororo tribes in the Mato Grosso region of Brazil, where he did his first and primary fieldwork, he found among them a dogged quest not just to satisfy material needs but also to understand origins, a sophisticated logic that governed even the most bizarre myths, and an implicit sense of order and design, even among tribes who practiced ruthless warfare. His work elevated the status of "the savage mind," a phrase that became the English title of one of his most forceful surveys, "La Pensée Sauvage" (1962). "The thirst for objective (and thus immortal?) knowledge,"he wrote, "is one of the most neglected aspects of the thought of people we call 'primitive.' "
Claude Levi Strauss who wrote- "La Pensée Sauvage" (The 'Savage' Mind). If Claude Levi Strauss's "Structuralism" were to be defined as the urge to find roots in the pure principle of symmetry: then I suppose it could as well be called Sacred Geometry. But then I suppose - IF you knew the universe was a wave function- then you would say the same of quantum mechanics. (That's why this electrical engineer- like all the science of oneness- really has ONLY symmetry to discuss). Even though many would regard the impossibility of open sharing among today's physicists as 'SAUVAGE' (savage) - I still think Dr Strauss's indigenous subjects probably were more successful in discerning 'objective' knowledge. Any consult in a modern philosophy of science curriculum makes it clear- there is NO concensus on the meaning of objective knowledge. The (Implosive) point I would like to make- is that once you learn the universe is simply a compressible wave function in a universal quantum foam ('charge' travels like a liquid..or plasma) - then perhaps we get closer to the 'heart of the matter':.. so called 'objective knowledge' is in fact the place where waves agree to meet: the Implosive centripetal alKHEMic flame of fusion.... hence defining the only role of mind among waves- to produce that (implosive/ alKHEMic / centripetal / bindu / omega / still / zero / fusion / flame letter) point of AGREEMENT among waves. literally - the perfect flame..
a raw idea is still charge embedded.. a cooked one- usually has seen it's charge isolated by a fractionating heat..
A wave pattern which is in phase (embedded) in its enviornment - (fractality defines grounding for electricians AND psychologists) - acheives sustainability by becoming distributeable / 'share-able'. This forms the only ecologically serious definition of sustainability- not to mention immortality- in the same way the Hopi (& aboriginals) regard their ancestors 'dreaming presence' whose living plasma fractally inhabits Old Oraibe. What is objective is therefore by definition the part of ('living') charge (the vacuum inertia/plasma.. the part of YOUR AURA) whose distribution acheives sustainable distribution- by reaching fusion.. literally the flame - of fractality. There- only the (perfectly phase conjugate or fractal) shareable wave survives. This is the physics of success at death. Note (at link) how the geometry of the sequence of visions SEEN at death confirms this symmetry as the sequence of folding operations DNA uses to GET YOU TO THE FLAME! 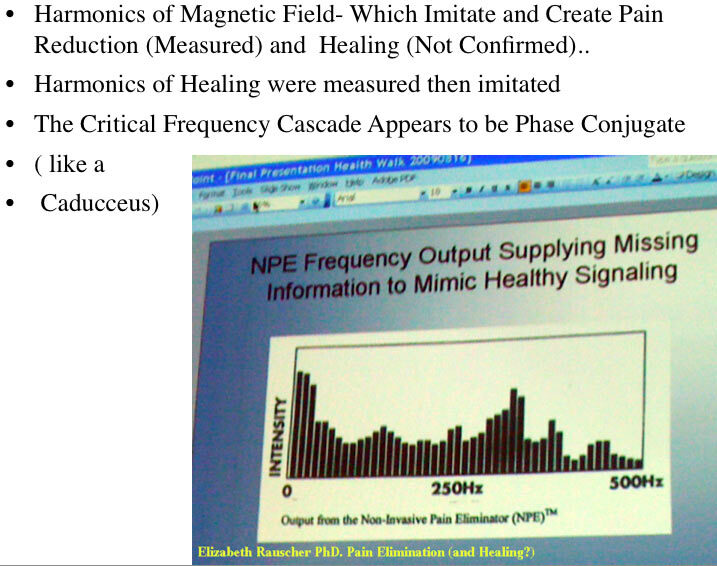 Here is your first clue to phase conjugating magnetics: my new equation for hydrogen frequency and radii (goldenmean.info/coincidence) - predicts THESE magnetic harmonics- Prof.Elizabeth Rauscher found (in FDA study) eliminate pain and accelerate healing. What Dr.Rauscher later realized was this is an example of Dan Winter's concept of PHASE CONJUGATE MAGNETICS. Later Winter- has shown that you can take the KEY FREQUENCIES in this graph and DERIVE THEM- from his original equation for the geometry of hydrogen (radius AND frequency): proof of the fractal nature of gravity. ( goldenmean.info/goldenproof , goldenmean.info.coincidence ). This much deeper physics now provides the backdrop- as Winter has used ONLY AND PRECISELY THESE FREQUENCIES and geometry IN EVERY INVENTION HERE. (Pyraphi and Imploder are built exclusively with this precise golden ratio TO hydrogen and planck scaling factor - the ultimate global scaling solution! - goldenmean.info/globalscaling ). We are of course pleased to acknowledge and support dear Dr Elizabeth Rauscher- but now that we know how to complete the harmonic cascade by definition from a deeper physics (phase conjugation to Planck) - we will carry this work to completely new level. What this means is we now know precisely the magnetic (and by analog-dielectric) FIELD which restores compression and is the FIELD SYMMETRY KEY to healing and tissue regeneration in general. Winter and his team (thanks to Andrew!) are deeply engaged in installing this variable DC optimized field in beautiful 3D array - in Winter's newest invention: the ICOSAPHI (stay tuned). Bone generation / stem cell switching and more- trials planned. Serious collaborator inquiries only please- contact below. A Revolution in LIFE AFFIRMING Technologies- based upon the simple but quintessential new understanding that life - and all self-organization to emerge from chaos happens- when fields and waves become CENTRIPETAL. The geometry of centripetal force - inviting perfect compression - is called FRACTAL- here referring specifically to what all the fractal mathematics completely missed: which how to water waves, and light waves, and electric field waves- make a FIELD EFFECT- which is fractal - in 3D. Mathematics has long known - probably the most beautiful property of fractals- is they are infinitely compressible. But few have conceived the real magic of this property when applied to field theory. It is said that Einstein was quite clear- that if he knew the symmetry (or wave shape) of infinite constructive compression- he would have solved the Unified Field problem. This is because - gravity itself - is said to be infinite or perfect collapse for electric charge. Sadly since- Einstein was never told what a fractal is - he never learned what a fractal electric FIELD could be. It turns out that the simplest example of what a fractal electric field is- is a dodecahedron. It you extend the edges straight out - by Golden Ratio - it makes an icosahedron. Do that again - edges straight extended by Golden Ratio- you have another dodeca. This makes an infinite nest. Golden Ratio is the geometry of perfect fractality - because it is the only way WAVES can make their inside- look like the outside. Self-similarity perfected- we later see is self reference perfected- meaning ability to emerge from chaos - which is electrically - identical to the origin of self organization AND self awareness! You can see that we get into deep water quickly here. The point is- that once you understand how this golden ratio wave geometry is the origin of all wave shapes that become IMPLOSIVE and CENTRIPETAL- and THEREFORE ALIVE! - You can build LIFE AFFIRMING fractal field- technologies -in virtually every field- and bring life back from the brink of chaos. What happens is that when waves of electric charge- or compression in the quantum foam- cross in Golden Ratio (the essence of hydrogen formation - AND DNA formation) - they add and multiply their wave speeds ('phase velocities') constructively- turning compression in to acceleration (called gravity). This is the reason- hydrogen, gravity, life force, perception, color, self-organization - even bliss exists. SO - once you understand how to arrange waves (of light, of charge, of water, of air) into this pattern - you KNOW how to self organize, eliminate chaos and pollution - and create LIFE. Scientists call waves in this geometry PHASE CONJUGATION- and they know that self-organization is proven in phase conjugate optics. Other people call this golden mean curve to perfect damping (compression) - the CADUCEUS of HERMES. What scientists need to learn is that: this golden mean solution to all wave interference- also produces self-organization - in addition to phase conjugation in optics. We applied phase conjugate MAGNETICS in TheImploder to heal water - and create dramatic growth effects. We combined the conjugation of magnetics- with PHASE CONJUGATE HYDRODYNAMICS. This is Viktor Schauberger's dream of IMPLOSION in water coming true. To imagine the shape of PHASE CONJUGATION- (light, water, magnetism, electric charge) in all of the above- is simple- just imaging TWO PINE CONES- learning how to nicely kiss noses! the most important physics Einstein missed. The origin of spin- lies in the fact (Nassim and I agree) that the compressible ether flows like a liquid- and that movement stores the inertia (which defines mass) - since it's only sustainable movement - is rotation ( origin of mass and time). All other experiments- in moving ether failed because nothing else produced constructive wave interference ( golden ratio). That's how sacred geometry invented quantum mechanics- when golden ratio solved the problem of waves - and produced compression success (gravity, and the self organizing descrimination of phase - called perception- and the origin of color). Elizabeth Rauscher asked me : What is Charge? And it was the right question since- I based my unified compressible liquidity of medium- unified field - ideas- on charge itself. My answer was not as concise as it should have been. Today - I would say: charge is the compression versus the rarefaction of the liquid like compressible ether. Positive charge and and North magnetic being more centrifugal- to induce rarification, Negative charge and South Magnetic being more centripetal - to induce compression. All of which is a perfect introduction to the essence of fractality electrically ( an idea far too advanced for poor Mandelbrot- rest his soul there..) - which is compression perfected. (The reason a negative ion creates healing - is it is electrically precisely fractal- like my new equation for hydrogen-- a perfect nest for ions... which is why it is called Ion, Scion, John... a divine chip off the original block.. So later- when I pointed out the major limitation in Nassim's understanding: "The problem with physicists- is they do NOT know that golden ratio IS the generalized geometry of most constructive wave interference- (evidence: goldenmean.info/matrix ) AND they are not willing to check. This is why they are stuck not knowing that this is ALSO the solution to (charge) compression- and of course (as Einstein said)- perfecting compression IS the solution to unified field - and therefore the solution to gravity. In this article- you see that even Nassim Haramein- who has concluded with exquisite logic- that Golden Ratio is the universal scaling law to all of matter and black holes -he in fact is unaware WHY (because only this geometry actually permits compression- as constuctive interference) See below- so he says: golden ratio is the RESULT of black hole dynamics- when in fact the opposite is the case: golden ratio (perfected charge conjugation of velocity phases-golden ratio recursive adding and multiplying of wave speed produces the acceleration from compression CALLED graivity) is the CAUSE of black hole and gravity dynamics- which we first taught the physics community 5 years ago in Budapest." Nassim then took the time to comment on the phone - that if I had explained what I had meant by charge in terms of the liquidity of the vacuum - he would have better understood me in Budapest years ago. ( Now I am having the last laugh- because most of the physicists there Nassim, Rauscher, Amoroso, were dismissive when I presented Golden Ratio Fractality causes gravity - Fred Wolf's arrogance at the second Budapest conference was even worse... Bill Tiller is old enough to be forgiven - at least Tiller figured out THAT focused human attenion compresses charge- you couldn't expect him to figure out why...- see below). Even stubborn Paul Laviolette- for all his inability to understand Golden Ratio physics- despite writing a whole book on how (Townsend Brown) capacitors make gravity- (the principle he missed: golden ratio physics)- he actually has a reasonably useful name for the process: sub quantum kinetics. The liquidity of charge in the vacuum is pushed and pulled in and out of compression (and therefore MASS) by ... Golden Ratio fractality. In other words- the next Earth civilization (this one's pretty much ready for post mortem analysis) - will use the same golden ratio fractality to get it's chargefrom gravity and the vacuum that pine cone's do. Architecture of Life : Hospital design, building design, city design, farm design: no other test for success is required other than IF THEY CAN ATTRACT CHARGE. FUSION's source symmetry: why the original term SHEM- (fractal capacitor / 'highward fire stone' - the schem-e) became not just the black hole making definition of alCHEMy / CHEMistry- but the word for ALTAR in church. Well fractally embedded plasma of charge is called life force- precisely the opposite of what is available to your aura's charge inside most poisonous modern metal laced buildings. Loss of ground- equals loss of access to fractality.. what are your childrens "sole's" made of? Access to GROUND is access to the charge distribution of FRACTALITY- true for electricians AND psychologists! This nature of phase conjugation is inherently broad spectral (the geometry of the GROUND OF BEING- where ancestors ghosts still propagate). (2 pine cones learn to kiss noses..
(philips company almost had a clue looking for the right ceramic)- and reduction of radioactivity (centripetal force restored..
by becoming a SHAREABLE WAVE.- Notice how religion wars are eliminated.. This begins with plasma compression - the door to (living plasma / charge ) distribution solved.. Which magnetic harmonics produced pain reduction and healing? It is now clear- the actual harmonics in the 'mag-ic recipe' are in fact predicted by my planck golden ratio equation for hydrogen! Stay tuned as we develop PYRAPHI and ICOSAPHI. > phenomenon and the presence of this waveform type. > Sciences of the Czech Republic, Czech Republic. >> (and therefore constructive compression) ..